These badges are quality replicas of some of the many badges found throughout the southwestern United States. 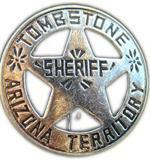 Since we are located in Tombstone, Arizona we specialize in offering the badges found in Tombstone and throughout Arizona. Old West Badges also make great gifts and are quite often used for western theme parties or as decorative accessories in a home office. Arizona Ranger Badge. 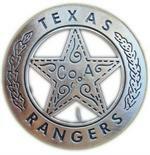 Quality reproduction of the five-pointed ball tipped star badges worn by the Arizona Rangers in 1903. 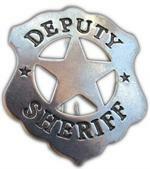 Replica Deputy Sheriff Badge - Quality Old West Law Badge. 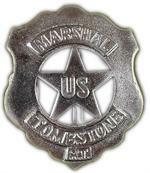 US Marshal Badge, Tombstone AZ - Quality reproduction Old West Law Badge.